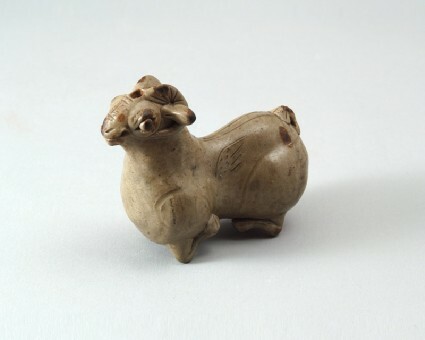 The small animal is finely shaped, depicted reclining, its legs seperately modelled and folded under the body. Small wings are indicated by incised and stippled lines on both sides, the spine is marked by incising, the tail attached like a small lug. The head is modelled with closed mouth, pearl-shaped eyes in carved sockets, curved horns and small ears, all with incised detail to indicate hair. The top is pierced with a circular hole that continues into the body. The thin light green glaze adheres well to the body. The features of the head are accentuated by iron-brown spots, and further brown spots are applied to the tail and on either side of it. The legs show remains of white firing supports underneath.